If you get off the freeway in Butte looking for a place to eat, one of the first options you see might be an older, nondescript building on South Montana Street ... part restaurant, part casino, and not really recommended. But a couple of generations ago, the place was something of a landmark, and one with a memorable name: Lloyd's of Butte. I don't know much about the history of the restaurant ... it was opened by a man named J. M. Lloyd in the 1940s or so, and it was in business under that name into the 60s. 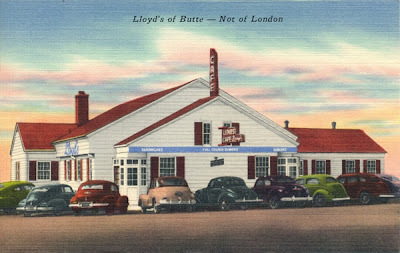 But it would have been a great place to visit just because of its advertising slogan: "Lloyd's of Butte -- not of London." Can't beat that! This is an old postcard view of Lloyd's, probably from the late 1940s or early 1950s.